If you’ve ever been to Olive Garden’s all-you-can-eat soup, salad and breadsticks lunch special, then you are going to love today’s recipe! I’ve been a fan of their Zuppa Toscana soup for as long as I can remember, but with all the fat and calories, indulging in this delicious dish at Olive Garden could easily cost me almost an entire day’s worth of Smart Points – and that’s before we factor in the breadsticks and salad. Yikes! So, I’ve come up with my own lighter version at home, and it is fantastic. It’s a simple, slow cooker recipe that turns out incredibly tasty, yet with just 6 Smart Points per serving. Admittedly, I was feeling quite lazy and made this with pre-cooked Italian sausage links from Applegate Farms. Ideally, you could use ground Italian chicken sausage for a more authentic flavor. But you will need to brown that sausage first before adding it to the slow cooker. By using the precooked sausage, I saved a step (and an extra pan to wash). Plus, Applegate’s sausages are really tasty! No harm, no foul. 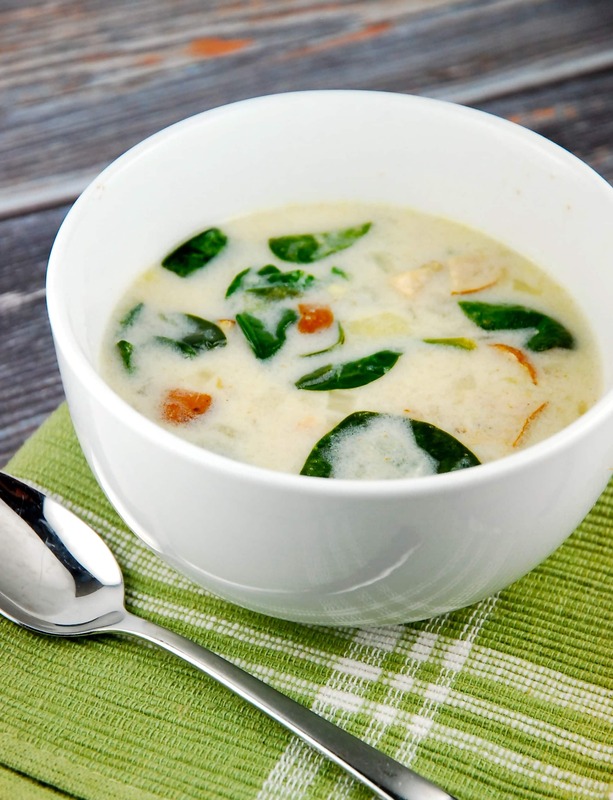 This copycat Olive Garden Zuppa Toscana recipe is a real win for any Weight Watcher. Enjoy! With all the authentic flavors of the Olive Garden soup, this copycat version is healthier, lighter and super convenient to make yourself at home. Add sausage, garlic potatoes, and onion to a slow cooker, and cover with chicken stock. Cover and cook on low for 4 hours or until potatoes are soft. In a medium sized bowl, whisk together the flour and half and half. Pour into the slow cooker, along with the spinach, and stir to combine. Cover and cook on high for 30-45 minutes, allowing the soup to thicken a bit. Season as desired with salt and pepper and red pepper flakes.